Woman Braked To Avoid Hitting Ducks But killed 2 People, Should She Be Jailed? One good deed does not constitute forgiveness in the eyes of law, especially when regarding death. Emma Czornobaj, 25, is now facing trial on offences of criminal negligence (failure to use reasonable care to avoid consequences that threaten or harm the safety of the public), and dangerous driving. 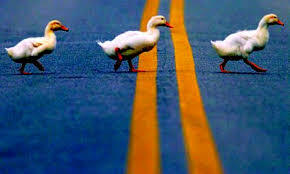 She swerved her car on a motorway in order to avoid missing a family of ducks. Although this action was heartfelt, she endangered the lives of others, and the motorbike behind her took a crash. As a result, Andre Roy, 50, and his daughter Jessie, 16, both died. Czornobaj has pleaded not guilty to all four charges against her. However she has been accused under criminal code that calls for maximum life sentence if convicted of criminal negligence, and 14 years imprisonment if convicted of the dangerous driving charges. The case could test the limits of charges, as it is apparent the girl braked in order to save the life of an innocent animal, but her actions still caused the death of two innocent people. The trial will involve 8 witnesses who will all be giving evidence. Everyone selected on the panel who had been involved in ,or knew someone who had been involved in an accident, has been removed – of which there were 3. The panel is majority male. They are now set to determine whether the accident involved criminal negligence, and whether they have heard enough evidence to find the accused guilty of dangerous driving. Unfortunately accidents happen daily. Anyone who has been subjected to harm at the fault of someone else, whether it was accident or not, is liable to seek compensation for their trauma. If you would like to discuss a claim, contact a solicitor for advice.